To make the crust put coconut flakes, salt, and vanilla in food processor. Begin to process, adding small amounts of the date until crust sticks together. Press the crust into a 9-inch pie pan greased with coconut butter. To make the pie filling blend coconut milk, coconut meat, dates, vanilla, and salt until smooth. Add lecithin and coconut butter and blend until well-incorporated. Pour into a prepared crust. Set in the refrigerator for an hour. 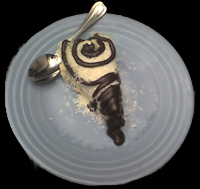 Garnish with 3/4 cup dry coconut flakes and drizzle decoratively with raw chocolate sauce.